1sprinkle 1 tbsp of granulated sugar to the warm milk.then,follow the yeast stir, set it aside. 2 mix all dry ingredients . 4 pour the milk & yeast mixture then the remaining of the flour. add the rest of the liquid which is the melted butter and the egg yolks. 6 after the machine knead the dough.let it rise for 1 hour before dividing it. 8 with a rolling pin flatten the dough long and thin.like 1/8 of an inch thick and like 8 inch long then spread the ube filling then the macapuno. 9.fold the dough sealing each side. 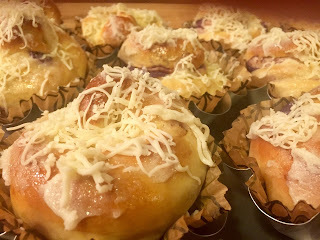 10.coil the dough and put it into the endsaymada mold i lined mine with muffin liner if you don't have liner you can just spray it with cooking spray. 11.let the ensaymada rise again for 1.5 hr.to 2 hours or until it doubled in size. 12.after 2 hour preheat your oven to 350 degrees. 14 bake it for 15 to 18 minutes. 16.if you like you can wrapped them individually with Glad press and seal.